With an exclusive South Coast oceanfront position, this freestanding home located on Denham's Beach blends luxury with coastal style. Enjoying breathtaking views across Denham's Beach from almost every room, this private retreat like home needs to be viewed to truly appreciate the incredible ocean surrounds. Located within the sought after gated Quarterdeck complex, assuring privacy, seclusion and a relaxed coastal lifestyle. Offering three generous bedrooms, master suite with ensuite and built in robes. Additional study or fourth bedroom opportunity. Enjoying both formal and informal living and dining spaces perfect for entertaining guests and family. The kitchen is modern and spacious, encapsulating the heart of the home, with stone benchtops and stainless steel European appliances. Offering multiple outdoor, child friendly entertaining spaces that have been designed to capture the stunning ocean views for all angles. Spaces include a covered outdoor barbecue kitchen and wood-fired pizza oven and additional spacious decked platform, perfect for relaxing and enjoying the spectacular views. This home has been flawlessly designed to capture the panoramic views to Denham's Beach, Surf Beach, Wimbie Beach and out to the Pacific Ocean. With a double garage and with the use of the complex pool this property offers all that beachside luxury represents. 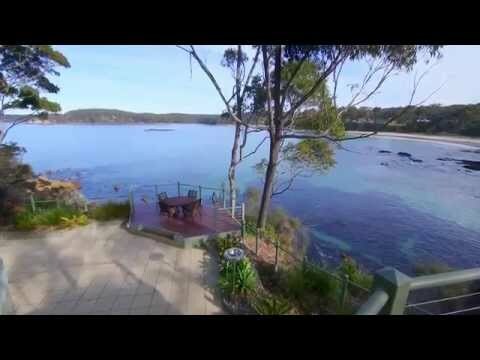 This magical coastal home has the calming effect of feeling like you are in complete seclusion, whilst located only 8 minutes away from the bustling Batemans Bay and Moruya Airport is just a 20 minute drive.